Our patient centered, custom themed solutions are created specifically for the success of pediatric and adult patient providers. Soon after we install your preferred custom designed environment, you will experience the benefits of increased referrals, improved patient satisfaction scores, reduced sedations, decreased examination times and improved staff productivity and morale. overall quality of care and well being for both your patients and staff. Character Farms is advancing diagnostic imaging one room at a time. We can transition your entire facility or department into a fresh, creative experience for your patients and your staff for year’s to come. Pelican Themed patient room with faux bamboo. This character themed Pelican Room welcomes the young patients and relaxes them during their examinations. The Pelican acts as a positive distraction that takes their minds off of being in a medical setting. 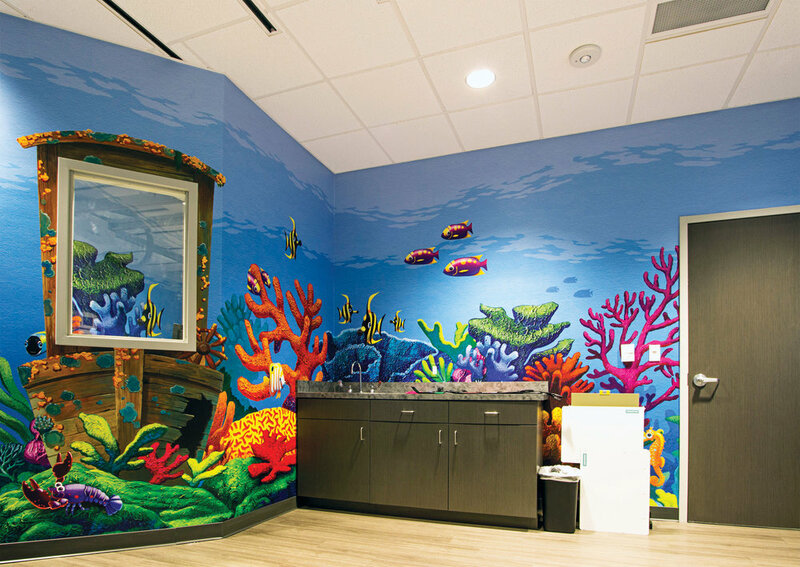 This themed patient room with custom wall murals was created for Children’s Health Imaging Center in Dallas, Texas. Character Farms is a leader in deigning and illustrating interiors within the Medical and Imaging environments. We create child-friendly interior rooms that are custom for the specifications of every room. This crab is ready for the beach. The perfect positive distraction fo young patients who are normally anxious when in a medical setting. This themed patient room with custom wall mural was created for Children’s Health Imaging Center located in Dallas, Texas. Character Farms creates custom themed interiors for the medical and diagnostic imaging environment. We specialize in custom themed wall murals. This funny looking fish welcomes children into this examination room. The young patients become distracted by the bright colors and engaging theme of this wall mural. This themed patient room with custom character wall murals was created for Children’s Health Imaging located in Dallas, Texas. Character farms is the environmental theming company for the medical and diagnostic imaging industry. We custom design and illustrate mural for walls and design and fabricate custom faux themed game and play elements. This 5 station iPad game kiosk is fun for kids of all ages. Each game is placed at an age appropriate height for very small children to adult size. It fits well within this beach circular setting. This custom tropical themed playroom was created custom for Children’s Health Imaging Center in Dallas, Texas. Character Farms creates custom room environments for medical and diagnostic imaging clients. We custom design fun, calming MRI, CT and RAD room wrap graphics and facades. A tropical themed wall mural custom designed for not only a wall but the linen drawers of this large Imaging center located in Dallas, Texas. 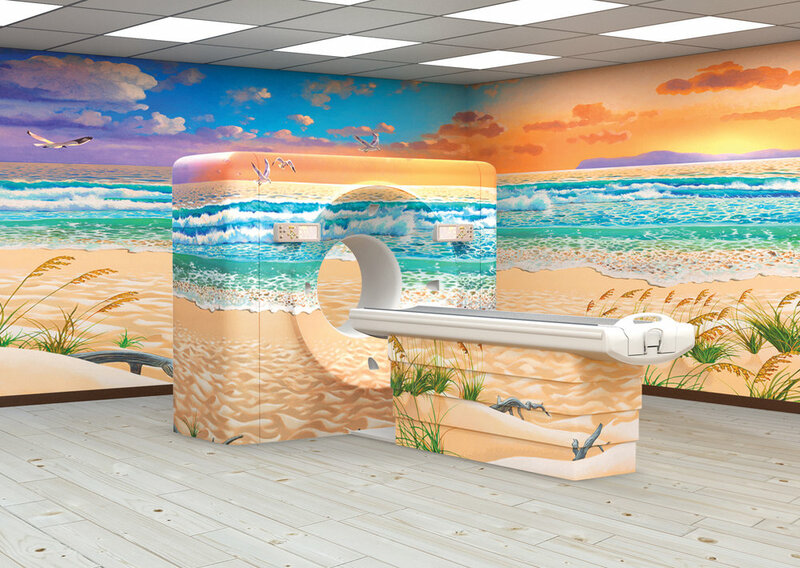 The first thing the patient sees when entering the treatment rooms of this large imaging center is a super fun, engaging and child-friendly beach wall mural with surfing crabs, sand castles and surf huts. We create custom themed check-in, hallways, waiting rooms, treatment rooms, patient rooms, MRI rooms, CT rooms and RAD rooms for hospitals and diagnostic imaging centers across the United States and beyond. When a young patient walks into this play room, they think they are at the beach. Complete with full beach themed wall murals with palm trees and islands. The custom designed and constructed surf hut has game walls and a place to color and draw. It even has a pelican that sits atop the faux rooftop. Character Farms is the leading provider of themed interiors for the medical and diagnostic imaging center industry. Not only did the children of this imaging center have a wonderful time while receiving imaging treatment, they are rewarded with a special gift when checking out at this custom themed surf shack. This was custom created for Children’s Health Imaging located in Dallas, Texas. Character Farms specializes in the creation of custom themed interiors for the medical and diagnostic imaging environments. Custom Play and Educational Ambulance for Pediatric Patients. 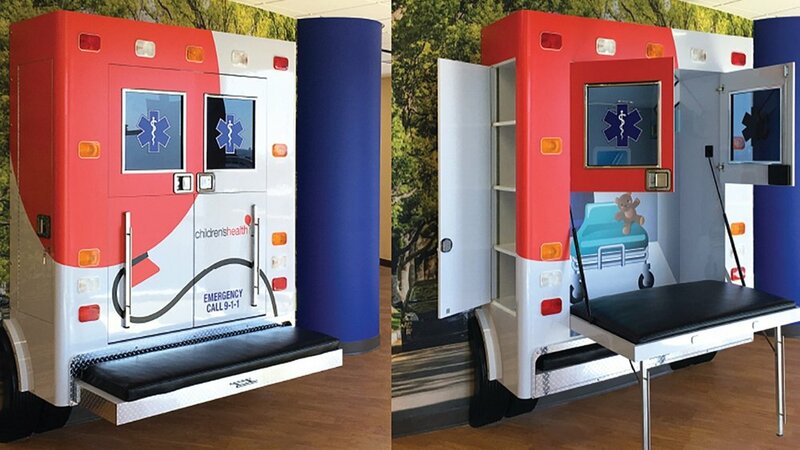 Character Farms created this custom life-size, child-friendly play and educational ambulance for the new children’s area of Children’s Health Hospital in Dallas, Texas. It gave children a chance to interact with a life sized ambulance and to interact and play. This helped children with their fear of ambulances in the times they are called on. Character Farms provides interactive, engaging themed environments for check-in, waiting and treatment rooms for hospitals and imaging centers throughout the country. 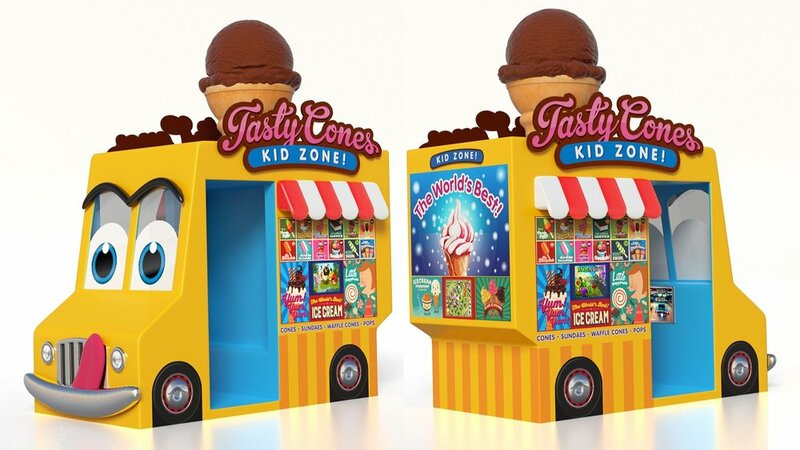 This custom designed ice cream truck character has four iPad game station areas. Children run towards it when they first notice it. They can even pretend to drive it. This fun, engaging, child-friendly themed game truck was created to positively distract the children while they wait for treatment. Character Farms provides hospitals with kid friendly, fun and engaging spaces throughout the medical and imaging industry. 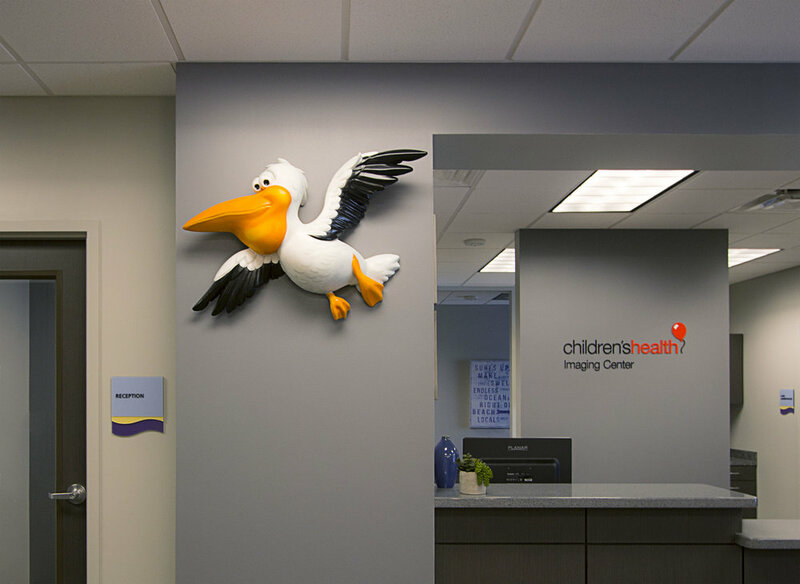 This Children’s Pediatric Health Center located in Mississippi wanted us to create scenes with all the local wildlife. We utilized a fun, illustration style that really brought these murals to life. Character Farms creates custom wall murals for both walls and quiet room doors. This double Horton Quiet Room door mural is a peaceful, welcoming nature scene of ducks in there natural setting. Character Farms creates custom themed interiors for all aspects of the medical and imaging industry. Not only do you see the fishermen above the water, you also see what is going on under the water. 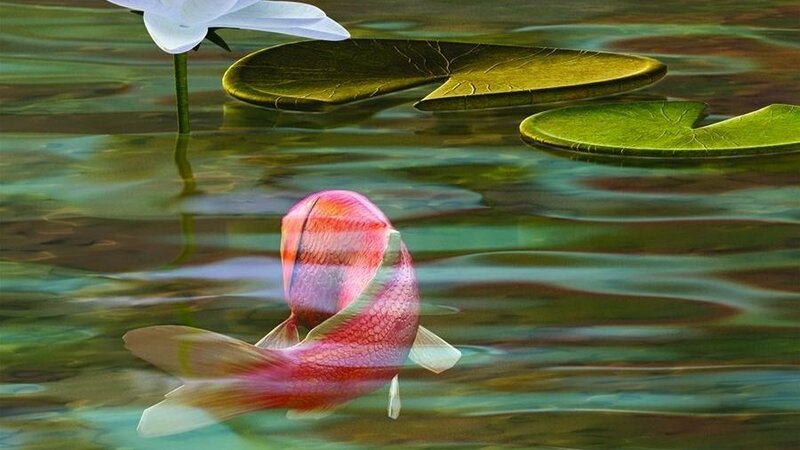 This stunningly peaceful fishing scene relaxes those who look at it. We created it for Horton double glass quiet room medical doors. Character Farms is the leading provider of custom themed wall murals and graphics for the medical and diagnostic imaging industry. Mississippi has a lot of areas that look just like this. We were inspired by the turtles sunning themselves while sitting on logs in the deep swamps of Mississippi. The beautiful color and shapes of this double door glass mural is stunningly beautiful and engaging. Character Farms is the best provider for themed interiors within the medical and imaging industry. This angle shows a Japanese Shoji mural that surrounds the technician window in this CT treatment room. What looks real is actual a mural with details that fool the eye. We created this super peaceful and beautiful theme to help adult patients feel less stress during their imaging treatment. Character farms has been creating themed wall murals and play interiors for over ten years in the medical and imaging industry category. 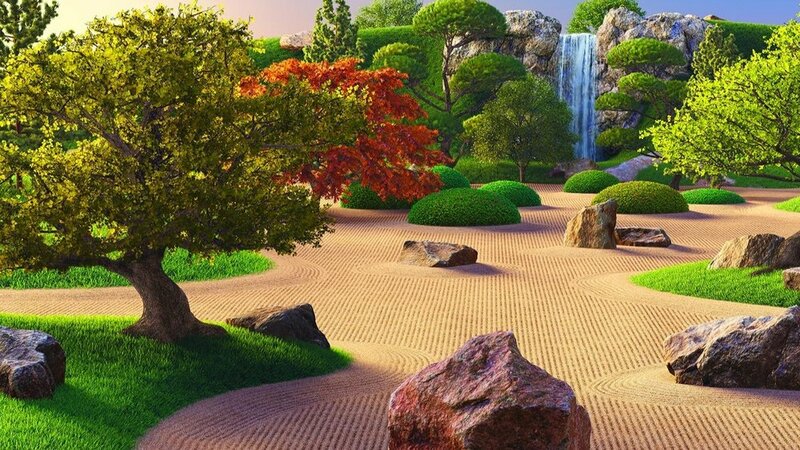 This custom themed Zen water garden mural was digitally illustrated to look as real as you can get. It contain every detail including scales on goldfish and every leave detail on trees. Patients walk into a calm and peaceful setting to help them receive better patient outcomes. We are known throughout the medical and diagnostic imaging industry for creating the best quality custom themed wall murals and play areas for children in the pediatric hospital and imaging settings. This custom digitally illustrated Japanese Rock Garden Themed CT room has all the details that make it so believable. Most patients think it is photography, but it is custom designed and created by Character Farms to help adult and pediatric patients who are normally anxious and stressed during CT treatment. They are calmed and relaxed when they enter this room, making for better patient outcomes. Character Farms creates custom themed murals for both adult and pediatric medical and imaging facilities across the country. The details are breathtaking. Character Farms created a Water Garden themed adult wall mural to look as real as it gets. We wanted for patients to really feel that they were in a Japanese Pagoda looking out into a Zen water garden. Technicians say that every patient who enter this CT room smiles as they walk in and smile when they leave. We’ve been providing the best quality wall murals for adult and children in the hospital and imaging environmental setting. From every reflection in the water to every leave on the foliage. This wall mural is truly breathtaking. 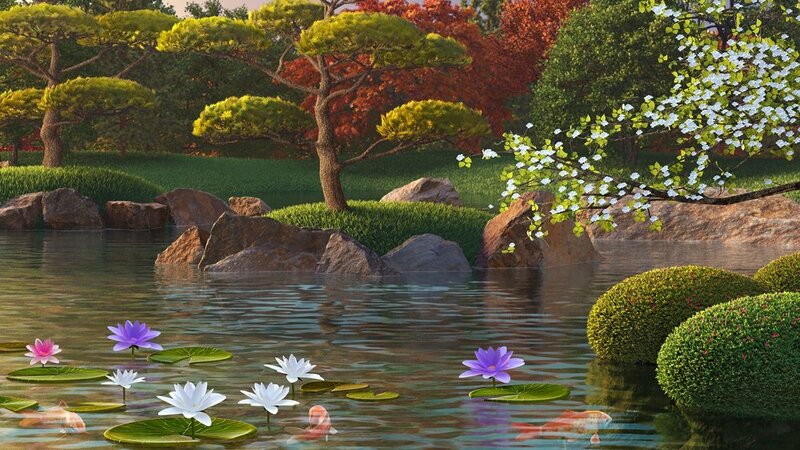 The beauty and peaceful scenes of this Zen themed CT room wall mural envelopes every patient who enter this room for treatment. It makes patients more relaxed and helps improve patient outcomes. Character Farms provides patient centered care environments for both medical and imaging facilities across the globe. Patients who enter this custom themed Zen CT room for treatment are in awe of the depth of detail and beauty of this rock garden. The shadows of this bonsai tree looks so 3D to the eye. Patient outcomes have improved dramatically since this wall mural was installed. Character Farms is a leading provider in adult and children’s custom interior environments for both hospitals and diagnostic imaging centers.